This article on DSD vs PCM was reproduced from the educational archives of Yuri’s Sample Rate Converter website with his kind permission. All copyright belongs to said website and any reproduction of this information below can only be done with the express permission of Yuri Korzunov. 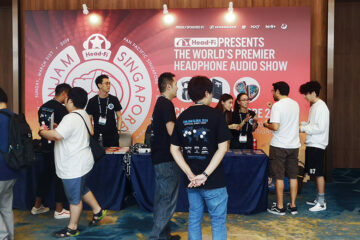 DSD vs PCM competition leads to many disputes around. These formats are not so different as seems as discussed here. Read about some myths and its technical explanation. 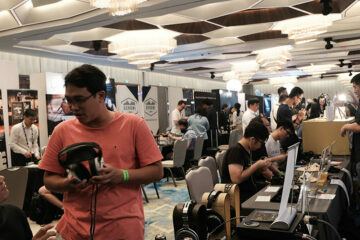 DSD can be considered as format superior in audio quality than PCM. DSD can’t be “native” edited without intermediate conversion to PCM. Point 2 will lead to a significant loss of quality due to ‘decimation’. What is digital audio format quality? First, we should define what we mean by “digital audio format quality”. Digital audio format quality is defined by the degree of loss of the original analog waveforms when restored from digital forms. There is no mystery to this definition. It is fine detected via spectral-time analysis in different forms. Sometimes it is as simple as trying to detect the degree of difference between the original and restored digital signal via a set of measurements. The spectral method is likely to be the more informative and sensitive to possible distortions in the digital audio format that could creep in. 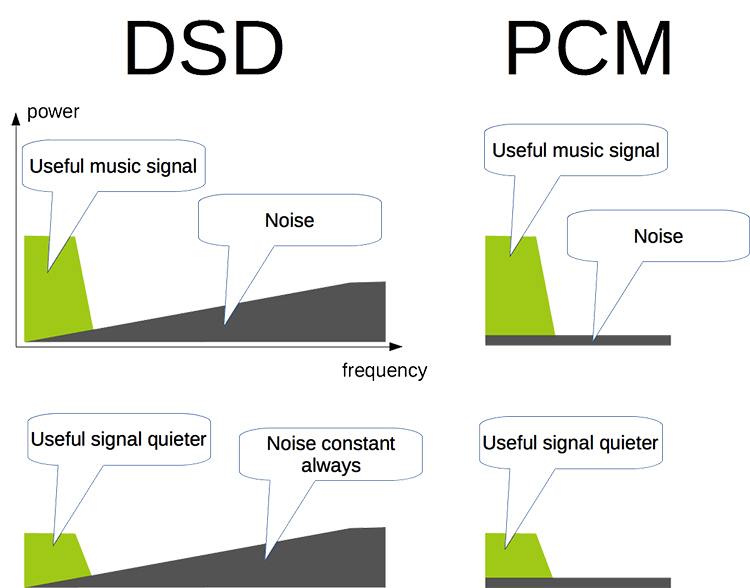 The differences between PCM (pulse-code modulation) and DSD (sigma-delta modulation) are not so strong, as it seems. Both kinds of modulation contain carried (musical) signal in most low parts of the spectrum. There are differences in quantization noise distribution and behavior. For PCM, quantization noise is evenly distributed across range 0 … [sample rate]/2. For DSD noise is pushed to inaudible (high) part of the spectrum. For pushing (noise shaping) significant energy of noise out of the audible range you need a reserve of the band. I.e. higher sample rate, than for PCM, is needed. PCM quantization noise correlates with useful signals: no signal equals noN noise. DSD noise does not depend on signal and is present in silence also. DSD DACs eliminate this noise. Each audio application begins with an analog-digital converter (ADC). There are many types of ADC. Any ADC must provide suppression on stuff over [sample rate/2] before the analog signal can be digitized. Otherwise, the stuff will shift or mirror into the low half range of the sample rate. It is recommended to suppress all noise above the transmitted audio band 0 … 20 kHz (maybe slightly more). This is to avoid transmitting excess energy that diminishes dynamical range. For PCM and DSD ADC, suppression is provided via analog low-frequency filter only. Filters have slope suppression characteristics by frequency (suppression of about 20 … 48 dB per octave). An octave is a difference of frequencies in 2 times. The more recorded sample rate, the more the suppression and thus the better quality of the sound captured. DSD ADC has significantly higher sample rates than PCM DAC. It provides better suppression in forbidden frequency ranges. There are lots of excess noise that can be further filtered in digital form. Using a resistor matrix in ADC demands a very high precision of electronic components and voltage. A simpler decision is to use a fast-growing saw voltage for measuring the input analog value. This is the principle of DSD. I.e. DSD is simpler/cheaper format for capturing sound rather than using PCM. Applying a DSD-DAC allow maximally simplify scheme and adjusting of DAC. DSD DAC is a simple low-frequency filter (that passes low-frequency audio only). It is a higher sample rate than for PCM and simplifies the design of an analog filter. No need for steep transients to the suppression area as you need for PCM. No need for so many precise components. Almost all modern DAC use internal PCM to DSD conversion for digital-analog conversion. If you use DSD as an end-user format you need 1 precise reference voltage and simple analog filtering only. I.e. same result with less effort than “native” PCM. I have yet to compare digitizing/restoring to the analog of the square wave for PCM and DSD. There is an advantage in DSD due to its steeper front and less ringing in front/end sides of square impulse. Let consider how to ideally digitize/restore the square wave. A Square wave has an infinite spectrum. I.e. for ideal digitizing/restoring you need infinite sample rate. DSD has a significantly higher sample rate than that of PCM. It is the reason for a steeper front/end of the square impulse. Lower ringing for DSD is the result of a shallower filter than that used for PCM signals that have lower sample rates. On the flip side, using wider (more 20…24 kHz) bands for DSD generates more noise energy particularly beyond 24 kHz. I.e. 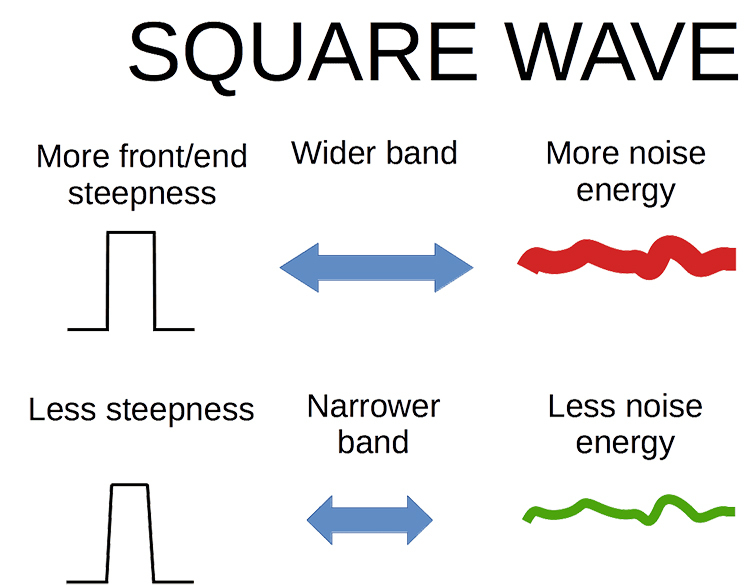 price of a better form of a square wave is a higher noise level. Lesser ringing due to a shallower DSD DAC filter (less ringing) leads to worse filtration. Thus leading to a higher noise level. By increasing the PCM sample rate it is possible to achieve a steeper front/end of the square impulse also. I.e. no difference between DSD and PCM in the approach to restoring the square wave. There are results of sample rate and filter steepness only. Now let me ask why do we need to restore the ideal square wave for audio applications? There exists one solid and real-world proven theory: that humans listen or hear up to 20 kHz. 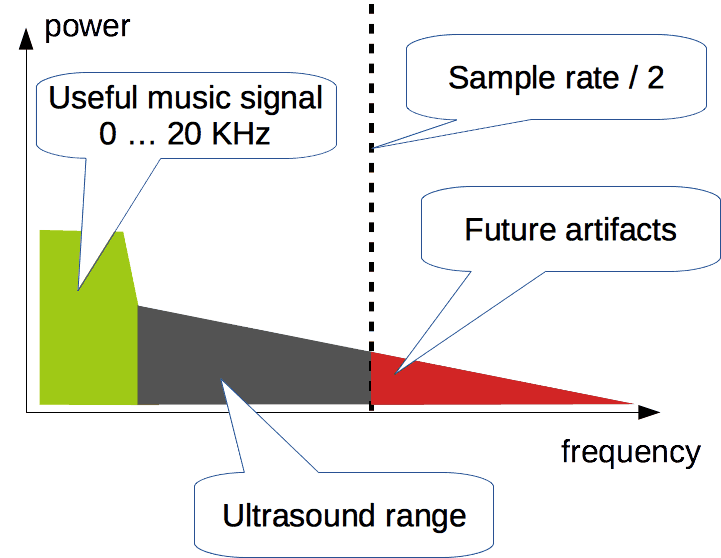 In audio applications we listen via ears, we do not watch via our eyes so we need to provide maximal fidelity in 0 … 20 kHz range. Thus I suppose, inside our head, we have the same shallower front level of the typical audio square wave to discern the quality of audio feedback on speakers and headphones. It is also a feature of our ears. So, why do we need to restore square form better than we can receive from our ears? The upper range that we cannot hear can be shifted to within the audible range after restoring due to non-linear distortions. Almost everybody knows that it is impossible to “natively” edit DSD. Here «native» is editing without intermediate converting to PCM. That is a poor process. What is bad about intermediate converting to PCM? PCM is a format where each sample is has a multi-bit value. Decimation is a simple process of removing excess samples to allow for us to decrease the sample rate. Before decimation, you need to filter all the frequencies in the upper half output sample rate so you can avoid distortions in the audible range. This filtering can cause ringing artifacts. However, it is often forgotten that qualitative filtration in total has significantly fewer artifacts than mixing and effect processing. Why do we need conversion to PCM? PCM has no noise in upper part of the spectrum. It allows us to successfully apply non-linear processing (as an example, overdrive/distortion effects) to musical stuff. As an alternative, we can suggest the use of multi-bit DSD. However “multi-bit” allow us to solve only the mixing and the simplest multiple volume-changing. Elementary changing level to 1 dB then it becomes a problem. Multi-bit DSD has noise in the upper part of the spectrum also too. Thus to apply non-linear processing we need to convert DSD to “PCM”. Also, we need to remember that computers can apply multibit maths processing only. The end-user of an editing system does not need to worry about intermediate conversion(s). It is the engineer’s troubles on how to find “hidden” possibilities and what “tricks” need to be applied. We only need to consider an editing system as a ready-made decision. The main problem is that DSD and PCM are technically impossible to compare as digital formats. It is, however, possible to compare o systems that use either PCM or DSD or both. These systems must be considered as “black boxes” with input and output analog signals. These signals can be compared via spectral methods or listening tests. The final result depends on used components, adjusting, and technical decisions. Digital audio format quality is the degree of loss of an original analog waveform that is restored from digital forms. 1. It is technically impossible to compare DSD and PCM as pure digital formats. You need to compare released systems, that use these formats. 2. Editing DSD with qualitative intermediate conversion (decimation) to PCM gives fewer distortions than mixing and effects. So here is not a bottleneck. For minimizing loss we recommend using pro-quality algorithms and “hidden” technical possibilities (field for inventors). 3. “Native” DSD processing can be performed via precise multibit-DSD format. However, this leads to possible elementary operations only. 4. DSD is perfect for recording and end-user format due to simpler (cheaper) apparatus than “native” (voltage matrix) PCM ADC/DAC. 5. Master recordings are recommended to be saved in music production project format (precise PCM). After it is possible to convert to any format: lossless PCM, DSD. lossy. Practical superiority of the quality of each system is the subject of an engineering skill, but not in the used format. We need to use the strongest side of each format in music ecosystem.